The SFMTA continues to paint green-backed sharrows along lower Market Street in the wake of a re-paving by the Department of Public Works. The new markings have been spotted as far east as Fourth Street. 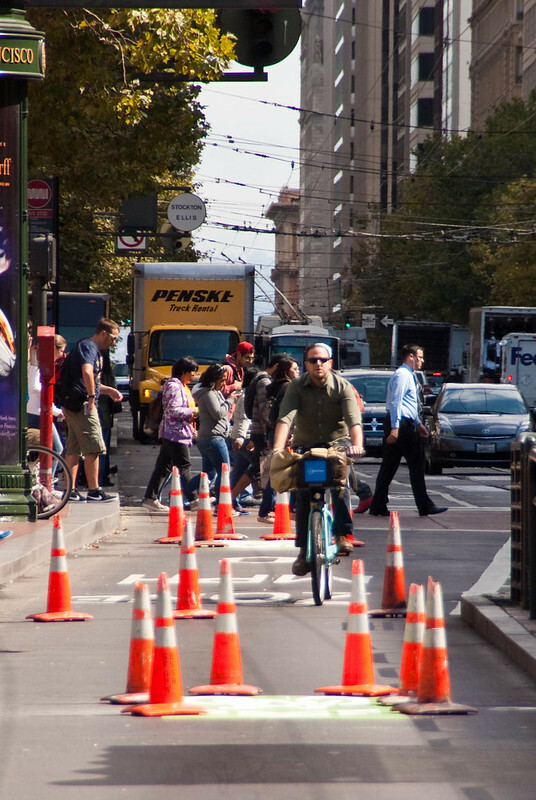 The combination is a nice treat that may help tide over San Franciscans who are still waiting for raised, protected bike lanes to be installed in who-knows-what-year. Fewer potholes and more visibility are nothing to sneeze at, and the increasingly continuous sharrows are starting to add some definition to the “Bay-to-Beach” route. Of course, we have Frank Chan to thank for the superb shots. 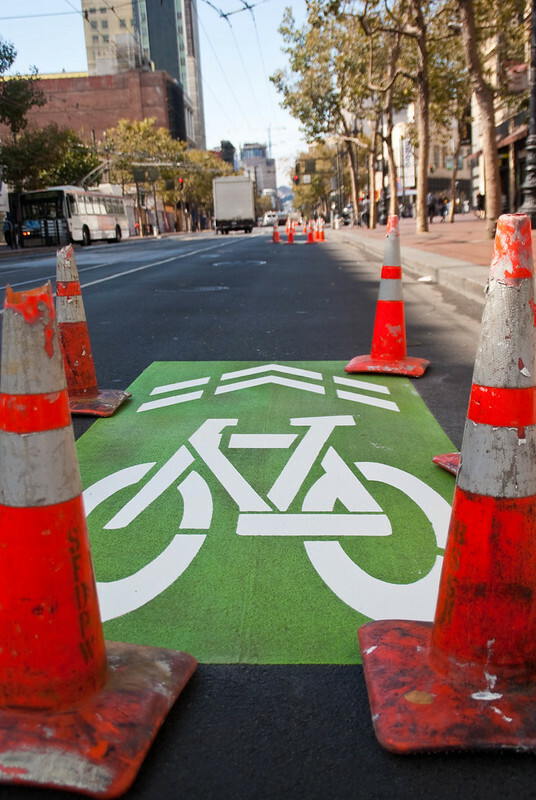 All of the green backed sharrows in SF are a nice upgrade from the standard version, but I can’t seem to convince engineers in other cities to employ them as they are still considered “experimental” in the MUTCD. Does anybody here know if SF is actually applying for the experiment process in everyone of these installations, and doing all of the required data collection throughout the process and reporting afterwards? Or, are they just putting the paint on the ground, liability be damned? There’s definitely little opposition to using green backed sharrows elsewhere, but nobody has the staff time to do the data collection and reporting. I’d be interested to hear what SF’s process is, or how they justify not participating in the official process. Someday separated bike lanes, but the green back sharrows are a wonderful incremental visible improvement. Thank you SFMTA.